Last night South by Southwest (SXSW) festivalgoers experienced an infusion of marching music via Austin’s own Drum Corps International World Class corps Genesis. 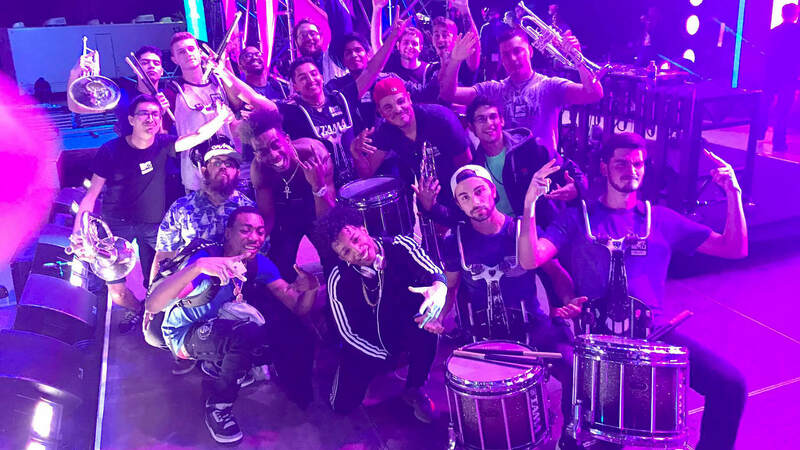 The corps put together a small brass and percussion ensemble that backed rapper Desiigner, as he performed his hit single “Outlet” as part of the MTV Woodie Awards. SXSW, is a 10-day Austin festival that has featured a variety of events during its 30-year existence. In a sense, it’s a festival of festivals, including music, film, interactive pursuits, and a variety of conferences. SXSW Music is now the largest music festival in the world, with more than 2,000 acts spread out across six days. MTV hosts the Woodies as a program of its college network mtvU. The event recognizes music voted as best by college students across the country, while also featuring live performances by up-and-coming artists that in 2017 included Desiigner, D.R.A.M., Lil Yachty, Jidenna, Khalid, and Starley. The Genesis ensemble consisted of current and former corps members. After a series of phone calls with the event producers, the Genesis staff and ensemble members hashed out the brass and percussion parts from the supplied recording. The group then met for an hour the day before the performance, followed by a half-hour rehearsal with Desiigner. After another half-hour rehearsal the day of the event, it was time for Desiigner and Genesis to perform in front of thousands of screaming SXSW attendees in addition to people around the world who watched via MTV’s live streaming broadcast.